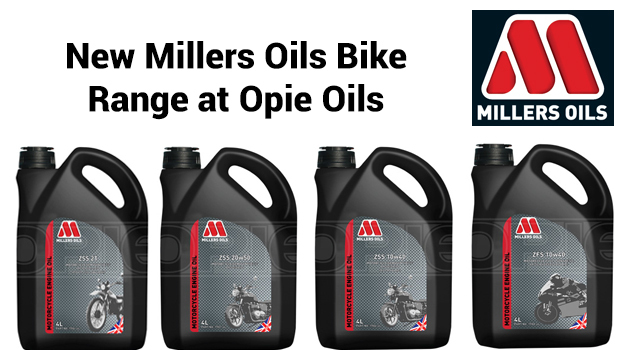 Opie Oils now stock the brand new award winning motorcycle oils and fluids from Millers Oils. Millers Oils have a range of high performance motorcycle oils formulated to cope with the high revving nature and higher operating temperatures experienced with motorcycle engines. Suitable for small-engined scooters to large V-twins, sports and race bikes, including those motorcycles running wet clutches. Millers Oils CB40 SAE40 Competition Castor Engine Oil is an SAE 40 competition castor based engine oil for 4 stroke engines. Designed for use with methanol or alcohol based fuels. All 4 stroke car or motorcycle engines which require a vegetable based oil. For use in engines running methanol or alcohol based fuels. Millers Oils ZSS ST Semi-Synthetic Motorcycle Engine Oil is a high performance semi-synthetic 2-stroke engine oil. It is formulated with a blend of mineral and synthetic base oils combined with ultra modern low ash additives. These are designed to give an excellent low smoke performance. Mix with petrol as recommended by the manufacturer for petrol/oil systems or in lube injection systems. Suitable for use in all 2 stroke motorcycles, kart and scooter engines. Millers Oils ZFS 2T Fully Synthetic Motorcycle Engine Oil is a fully synthetic 2-stroke motorcycle engine oil. Formulated using synthetic esters and ashless additives to give long term protection and high performance. Mix with petrol as recommended by the manufacturer for petrol/oil systems or in lube injection systems. Suitable for use in 2 stroke motorcycles, kart and scooter engines. Millers Oils ZSS 4T 10w-40 Semi Synthetic Motorcycle Engine Oil is a high performance semi-synthetic 4-stroke motorcycle engine oil. It includes a combination of the highest quality performance additives in synthetic and mineral base stocks. As received for engine lubrication of high performance 4-stroke motorcycle, kart and scooter engines specifying a 10w40 viscosity oil. Millers Oils ZFS 4T 10w-40 Fully Synthetic Motorcycle Engine Oil is a fully synthetic 4-stroke motorcycle engine oil. Formulated with the latest additive technology for maximum performance in 4-stroke motorcycles. Includes a constant high friction profile for wet clutch performance exceeding the JASO MA2 specification. Use as received for motorcycle engines and transmissions where maximum performance is required. Millers Oils ZSS 4T 20w-50 Semi Synthetic Motorcycle Engine Oil is a high performance semi-synthetic engine oil for 4-stroke motorcycle engines requiring a SAE 20w50 viscosity. Based on the highest quality performance additives and shear stable viscosity improvers in high quality synthetic and mineral base stocks to give long term protection and high performance characteristics. Use as received for lubrication of 4-stroke motorcycle, kart and scooter engines specifying a SAE 20w50 viscosity.